A billion-dollar business? Maybe not. Despite lofty projections for Facebook Gifts from analysts, reporters and myself, a new report picks apart public statements from the company to suggest it sold a maximum of 667,000 gifts in Q4 2012, and maybe a lot less. Sure, it’s early days, but it may take Facebook a while to build Gifts into a game changer. Correction: The original version of this article was predicated on an incorrect third-party report by Aggregift. It suggested Facebook earned a maximum of $1 million in revenue and sold 267,000 Gifts in Q4 2012 by working back from the fact that Facebook collected $5 million in revenue in Q4 2012 between Page Promoted Posts and Gifts. In reality, the $5 million announced on the earnings call was from Gifts and the more nascent User Promoted Posts product, about which less sales data is available, which prevents the type of analysis shown in the report. Facebook was given a chance to dispute the original report but declined to comment, despite the flawed methodology. This article has been heavily edited to improve accuracy. Facebook launched the ability for friends to buy each other real-world Gifts in September, though it wasn’t rolled out to all U.S. users until December. That means it certainly didn’t get all of Q4 to rake in e-commerce cash. Still, it was the Christmas season, and Facebook hawked Gifts in the Birthdays sidebar and at the top of the mobile feed, plus a big call-out to buy last-minute holiday presents. Facebook stated that it earned $5 million in Q4 2012 revenue from non-game payments, specifically Promoted Posts “and to a lesser extent from our new Gifts product.” That could be interpreted to mean Gifts equated to a maximum of $2.5 million in revenue in the quarter. At the end of November Facebook said the average amount spent per Gifts purchase was $25. While Facebook has not disclosed its revenue cut, this research uses 15% as a ballpark figure. When you crunch the numbers, you find that Facebook could have sold a maximum of 667,000 Gifts at $25 each. The deal-breaker statistic is that at most, just 0.4% of Facebook’s U.S. users bought a Gift in Q4. Estimates like my now overzealous-sounding $1 billion in yearly Gifts revenue are predicated on Facebook averaging as much as one gift sale per user per year. Facebook has to find a way to make Gifts much more mainstream if it’s ever going to be a material contribution to its bottom line. The somewhat disappointing stats confirm Mark Zuckerberg’s statements and might further dash hopes for Gifts to become a meaningful money-maker for the social network. They also explain why it’s been injecting new call outs to purchase them and discounts to lure in new buyers. Last week Inside Facebook reported that Facebook appears to be scanning status updates for words about new jobs, pregnancies, and child births, and encouraging the author’s friends to buy them Gifts. 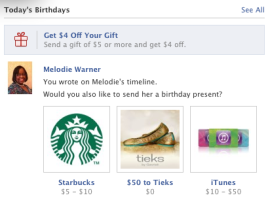 Then yesterday, CNET reported that Facebook is offering some users up to $4 off a Gifts purchase of $5 or more. Meanwhile it’s launched the Facebook Gifts Card, a slice of plastic that can be loaded up with credits to physical stores like The Olive Garden and Target. With time, as Facebook learns more about commerce, Gifts could become a more natural and frequently used part of the social network. But right now, pushing so hard to get people to give Gifts instead of saying Happy Birthday or congrats on the new job feels a bit smarmy. If it’s not making hundreds of millions of dollars on Gifts, it might not be worth putting money before friends.